For my first purchase with Outmotoring I bought a set of Gen 2 Clear Side Marker Lights and the product, the company, and their customer service is excellent! I will definitely use Outmotoring again for all my future MINI product needs! One of the most popular upgrades to the gen 1 MINI Hatchback Cooper and Convertible models is to replace the stock chrome or body colored grills with the Black Mesh Aero Style/ JCW Grill. There's something about the look of the MINI with the black grill that makes it much more aggressive and modern. While some prefer the body colored or chrome slat style grill that ships from the factory that black grill conversion is super popular which means a LOT of people prefer it. For years and year the only way to get the black aero grill look was to use the factory MINI grills that were sold along with the Aero body Kit. And, of course, we sell a ton of them every month and we have for many years. It's an awesome look. The downside to the factory MINI Cooper Black Mesh Aero Grill Kit is the installation is bit challenging for most DIY types. For that reason we also sell the aftermarket JCW Aero Style Grill for the MINI Cooper shown here. It's a simple replacement and will not require any of the tweaking needed (noted below) for the lower grill as it is a direct replacement once the old horizontal grills are removed. So, again, if you like the grill pattern of the factory Aero MINI Black Mesh Grill over the larger more open JCW Style Black Grill you will need to crank down and read the following and be prepared for about 2.5 hours of work. The upper grill is pretty simple install and only requires the removal of the old upper slat grill by prying off the old stamped metal 'nuts' that attach the grill to the hood. Because they are poorly made they are not actually threaded onto the grill because the grill only had solid posts molded into the back that protrude through the stamped holes in the backside of the hood. Due to manufacturing limitations they were not able to put threads on these posts so the nuts are just forced on during assembly and cut into the plastic posts which then hold the grill in place. The best way to get them off is to pry outward while twisting the stamped nuts off. The real challenge when installing the Aero Black Mesh Grill on the MINI Cooper is actually the lower grill that goes on the upper lip of the bumper. The factory lower grill is about 3" tall and is made up of 2 pieces. There's a 'lower lip' that is chrome and wraps along the bottom of the opening and then the middle horizontal part/rib that is usually body colored on the "S" model and Chrome on the Cooper base model. If your S model had the chrome exterior package then that horizontal rib would be chrome along with the mirrors and rear handle, etc. So, anyways, those two parts have to come off which is fairly easy. The lower lip part can be gently pried off by using a spatula to get started. Once you catch an edge you can pull the whole piece out- there's no hardware. Once it's gone you can pry from the outer edge of the horizontal rib and get under it to start removing it. it's held in place with double stick foam tape. Once it's gone you will need to cut out that support behind the slat. It's shaped like a louver and can be trimmed out with a small cutting wheel / dremel. I have found that the fiberous cut off discs are crappy and break off all the time but there is a special wheel that looks like a miniature circular saw blade. That's what you NEED. The other challenging part of the lower grill is trimming the lip of the NEW black aero grill to fit the depth of the recess area in the non aero factory bumper. Because the factory bumper was engineered differently than the Aero bumper, that recessed area is about 1/2 as deep so it requires some tweaking. Again, you will need a dremel and a cut off wheel to trim about 1/2 of the depth of that flange or lip return on the new grill. BUT, very important, you have to LEAVE the molded in tabs. Once you cut that skirt/lip off you will left with a slightly thinner grill that has a series of protruding tabs about every 10-14". Now, another problem. The slots in the old/factory bumper that correlate to those tabs are not in the same places as the tabs in the new grill. 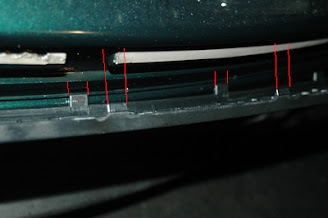 So, you will have to use some painters tape to allow you to mark where on the old bumper you need to cut new slots or widen the existing slots to line up with the tabs on the Aero Grill. Some will line up and others will not while a few will be just a bit off which will only require widening of the slots. I have found that the best tool for this is the "Rotozip" style cut off bits that are 1/8" diameter. They're not made for free hand cutting with a dremel but you can drop them right into the Dremel collar. Using that as a plunge cutter you can cut those slots in the few areas that you need while referencing the marks you made when lining up the new aero grill with the bumper- I prefer to line the opening with painters tape so I can make marks on the tape where the slots will start and stop. The reason why the 1/8" bit is perfect is that those slots need to be nearly exactly 1/8" tall to allow the tabs with the molded in 'hooks' to protrude and stay in place. Any larger and the grill will not stay in place without glue. Once the slots are made and the louver is cut off you may consider using black tape or black vinyl to cover up the unsightly opening. The other option is to paint it matte black...I have used 2" wide vinyl tape and it looks great. Then recheck all of your slots and taps and make sure they are in the right place and line up the grill and tap it onto place one tab at a time. If you have not cut the right amount of the lip the grill will not nest properly- so check out the pics below to see how much of that lip needs to be removed. I have found that following this process takes about 2.5 hours and can be done without removing the bumper!!! Thanks for taking the time to read this blog post about MINI Cooper Accessories. Outmotoring wants to be your first choice for MINI Cooper Accessories. Have comments or questions about the MINI Cooper Black Aero Grill Conversion Kit we offer? Please leave a comment below or contact us.